Usually when I leave an Indian restaurant I feel unpleasantly stuffed and vow only to eat lettuce for the next few days (obviously I don’t end up sticking to it). Roti Chai, however, is quite different. 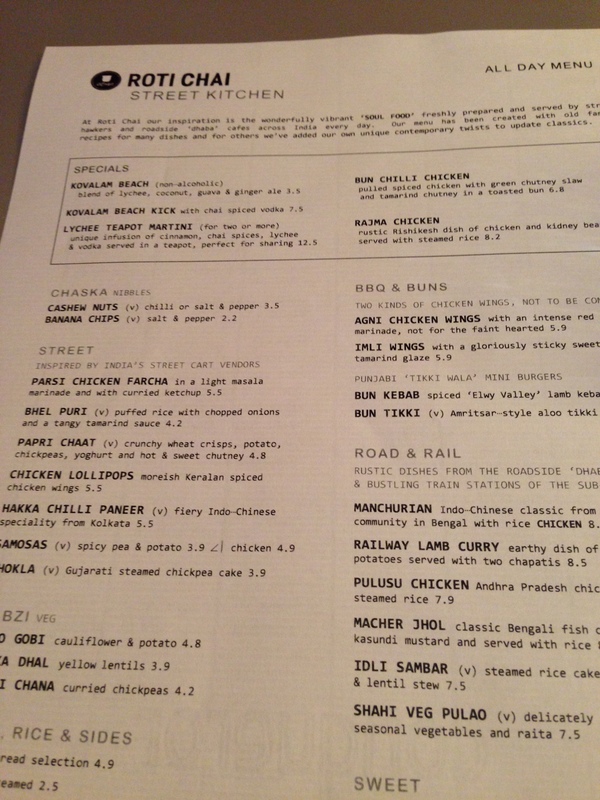 Dishes are small as the idea is to try a few dishes from the street section and a few from the road and rail section. My first impressions were strong; upon entrance I was hit with the pleasantly powerful aroma of spices that instantly took me back to my India trip a few years ago. Another good sign was that it was busy when we went at the unusual time of 5pm for a late lunch/early dinner. Before ordering we were brought a bowl of chilli cashew nuts that were unbelievably tasty, so much so that my fellow diner took the remaining nuts home. We ordered vegetable samosas, papri chaat (wheat crisps, chickpeas, yoghurt, potato, chutney), lamb curry, steamed rice, chicken lollipops (basically a very tasty chicken goujon). 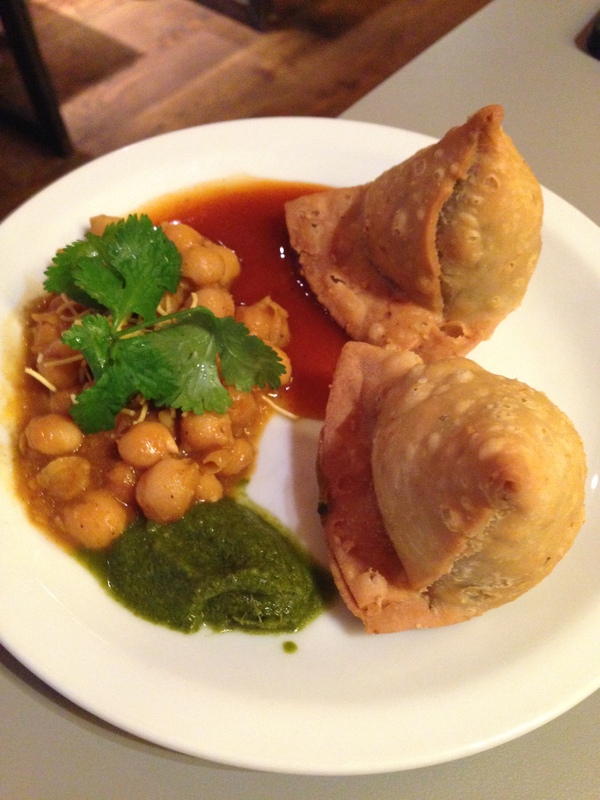 I didn’t like the samosas; there was something sour in them that put me off. Samosas aside I thought the food was excellent. 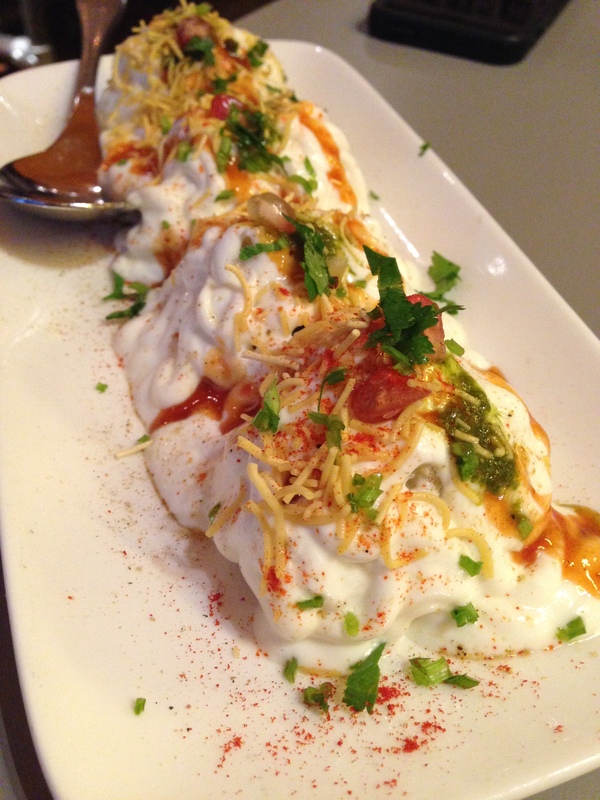 The papri chaat was wonderful as it was so interesting; the yoghurt was very slightly sweet but still savoury enough to complement the potato and chickpeas. 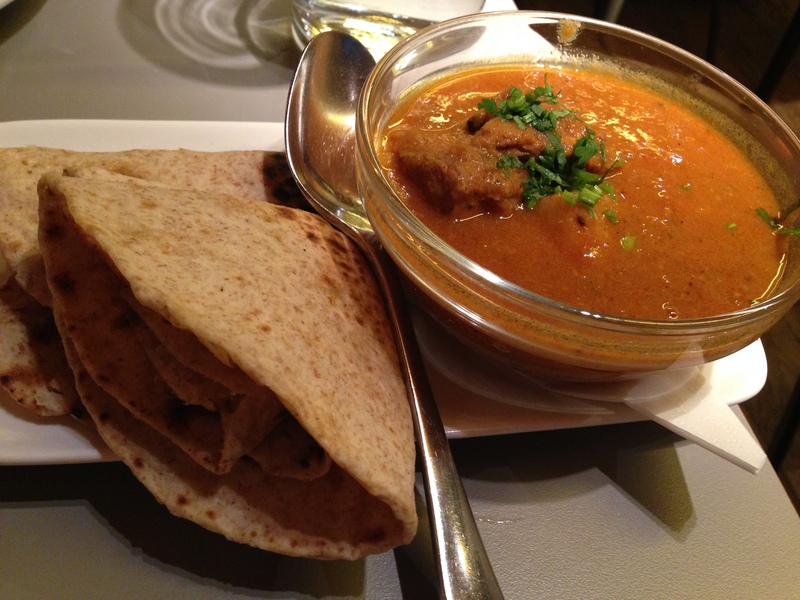 The lamb curry was again excellent! The sauce was so tasty and moreish and wasn’t heavy in the slightest and the lamb was succulent. 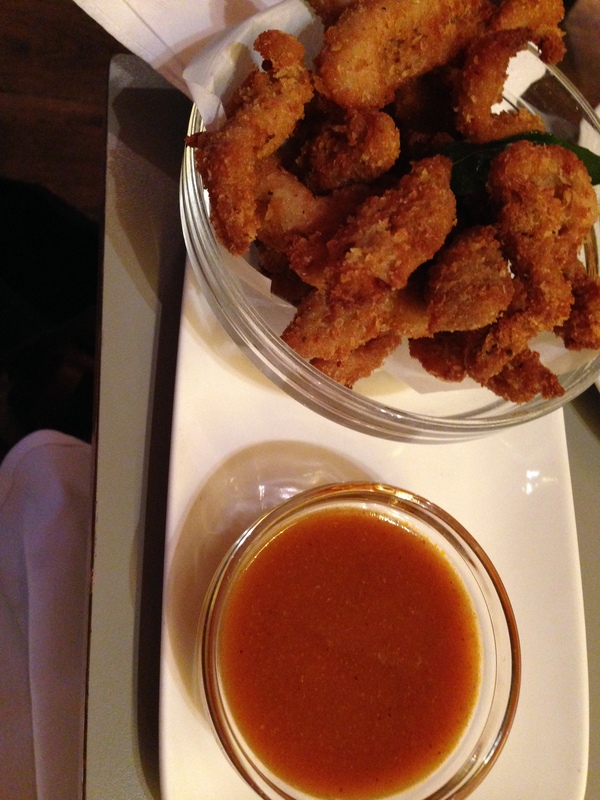 The chicken lollipops were cooked to perfection, crunchy on the outside but not too dry on the inside, and they were served with a great sweet and sour type sauce for dunking. Having extremely fond memories of drinking masala chai in the Himalayas, I didn’t even need to look at the other options on the tea menu. 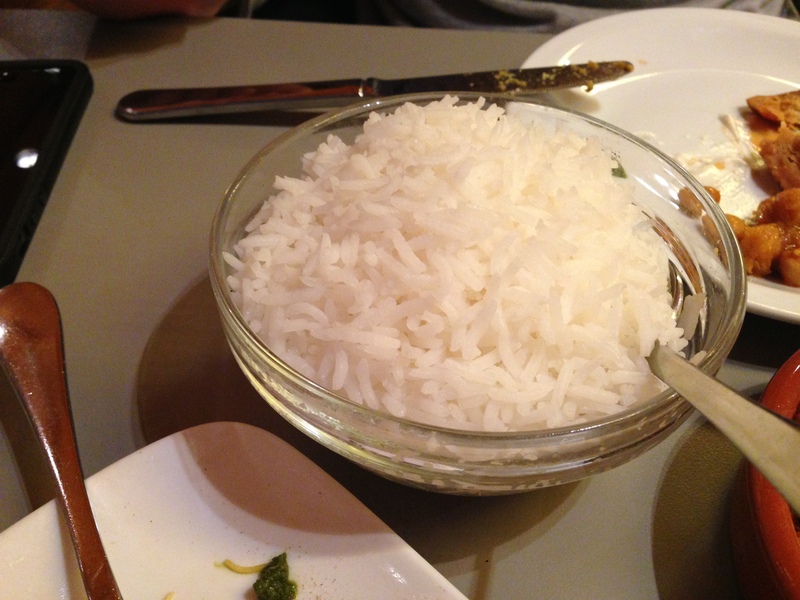 I was keen to recreate my Himalayan experience there and then. It was, as expected, superb; sweet, warming and with a kick. It was the perfect end to my meal and prepared me for the treacherous walk to the tube in the dark and rainy outdoors. 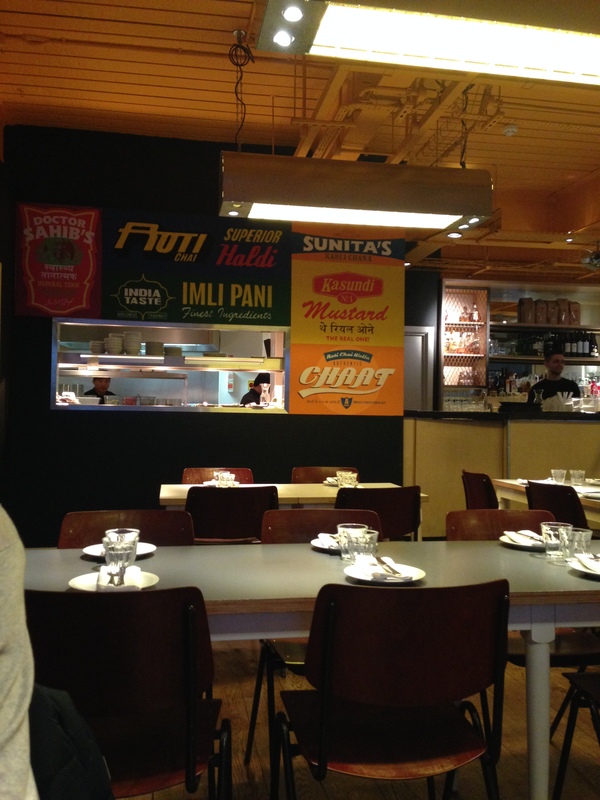 Roti Chai is fantastic, and very reasonably priced at £37 for two people.